Tonight we’re seeking to understand Nichiren Daishonin’s gosho: “King Rinda” Specifically we’ll be concentrating on the first part of the gosho & in this paper we will not address the legend of King Rinda. The initial point to recognize about this gosho—as with many other goshos—is the simple progression of the mentor disciple relationship. This pattern is fundamental to how knowledge & wisdom is passed down from generation to generation, from mentor to disciple, then as the disciple becomes the mentor & foreword, as the cycle continues with the teachings that become practice in the daily lives of everyday people like ourselves. In this particular context, in this reading, we have a discernable lineage: from Shakyamuni Buddha, to T’ien-t’ai, to Miao-lo, to Nichiren Daishonin, onward to Daisaku Ikeda & then into our hands here today (there are many other mentors that can be included in this progression, but for our use we’ll start with these). This primary structure is, in our context, a religious one; however, it does have a secular relevance. Any learning & knowledge transmission follows this pattern. This is the way others help us to know & to help us progress wisdom within the world. As this is a form of paying respect to the mentor, it is also about maintaining our own individuality, since so much of learning is about self-determination & self-direction. With all this foregoing said, let us turn to the gosho itself. Nichiren talks about some vital points that Miao-lo elucidated & Nichiren opens with the metaphor of the transformation from milk to ghee. The ‘Agama’ sutras are better known to us as the Hiniyana sutras & the others that he mentions (including the Lotus Sutra) can be classified as Mahayana sutras. We are shown that apart from even the precious taste of milk we can classify the Mahayana sutras according to the refinements of milk: e.g. cream, curdled milk, butter & then to the Nirvana Sutras that are the clarification of butter into ghee. The Lotus Sutra is therefore named: “The true lord of the ghee,” as it is then further distinguished from the Nirvana Sutra. On this hierarchy Nichiren writes: “The main point of these passages is that the five flavors serve to nourish life, but life itself is lord over all the five flavors.” The reason it is named as such is because it is the only teaching that Miao-lo gives the distinction of “opening the provisional & revealing the distant” We’ll explain the subtleties of this quote in a bit. Meanwhile, we’ll make the observation that even as we as position the Lotus Sutra as the ‘true lord of the ghee,’ let us not forget that the milk is still the base of the ghee & that ghee can’t be what it is without being milk first. Just as we can’t have the teachings of Nichiren Daishonin without the provisional teachings of Shakyamuni’s, & we can’t have our own enlightenment without the sufferings of the nine worlds, which are included in the world of enlightenment. With these observations, along with Miao-lo’s quote, we’ll see that the above reasoning is a key to understanding why the word myo is used in the title of the Lotus Sutra. Myo means wonderful, mystic, it means to open & it also means beyond conception. Because the word myo (mystic, mysterious) is given, also designates that this wisdom will not be readily known & that parts of it (& certainly with life in general) will remain mysterious. Above all, we must see this word as a designation of the Sutra’s superiority & that the wisdom that preceded & following it, is included within it—thereby stating that all wisdom is considered to be an aspect of the wonderful Lotus Sutra. “Opening the provisional & revealing the distant” signifies the core teaching of this gosho. 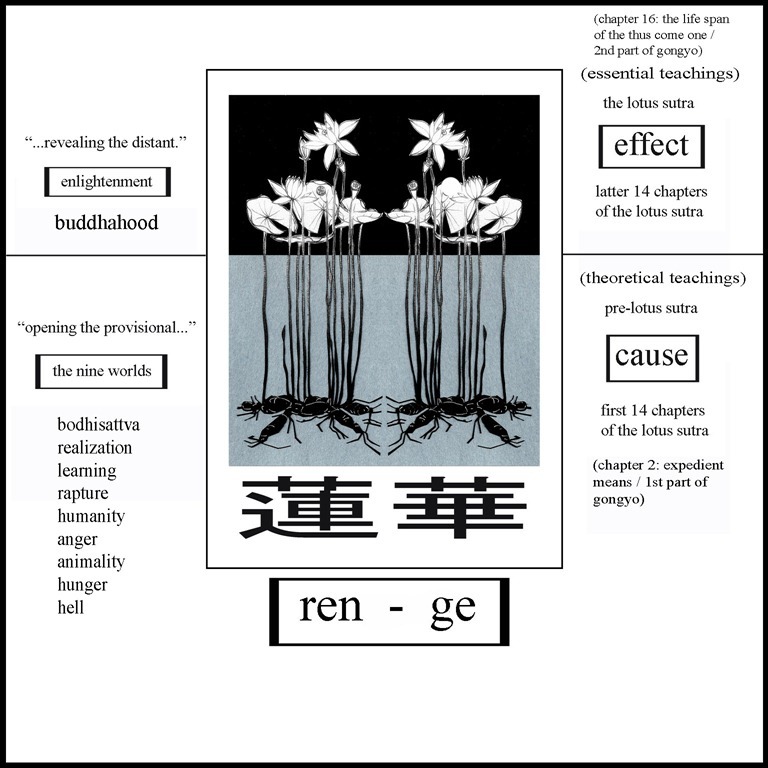 We are told by Nichiren that Miao-lo defines the two parts of the Chinese word renge (ren: 蓮 ge: 華) as the ge of ren/ge corresponds to the provisional teachings mentioned earlier & the ren corresponds to the distant. Ikeda then takes us to see that, not only does the “opening the provisional & revealing the distant” refer to the word renge, it additionally signifies a division of the twenty-eight chapters of the Lotus Sutra, whereby “opening the provisional…” is related predominantly to the “Expedient Means” chapter. We must continue to draw out that this fist part of the Lotus Sutra is to be known as the ‘theoretical teachings’ & the latter half (the last half of the Lotus Sutra) is to be known as the ‘essential teachings.’ The provisional teachings are what open up & lead to the true (distant) teachings. Aside from the Lotus Sutra the provisional teachings are said to be those that regard the ten worlds as separate & that certain people, including evil people & women, are not capable of attaining Buddhahood. Before we leave the first half of the phrase: “opening the provisional…” we’ll be sure to notice that Ikeda wants us to take notice of the way the word renge brings the phrase together with its other half: “revealing the distant.” We can see for ourselves that a way renge represents this has to do with seeing that ren means lotus flower & that ge means flower; most importantly, ren is the effect & ge is the cause. Ikeda writes: “In Buddhism, our lives in the nine worlds are viewed as the cause [ge] for attaining the effect [ren] of Buddhahood.” Renge represents the simultaneity of cause & effect because as we know, the word means lotus flower & the lotus blossoms & seeds at the same time. The lotus flower as a symbol is also of relevant to this quote (& our lives) for yet another reason; the lotus grows in the muddy swamp & its ugly roots enable it to grow & glean nutrients from the muddy water, it is in this crucial synthesis that the lotus can reveal its beautiful truth as a flower & as symbol for the enlightenment we all seek. Suffering is intrinsic to our enlightenment—we can’t cut off our sufferings & expect to be enlightened. We can’t have the lotus flower without its roots in the muddy swamp. We can’t have the clarified ghee without milk. We can’t have the Lotus Sutra without the provisional teachings. In order to overcome our sufferings, the sufferings have to be there to begin with. Fundamental darkness isn’t named fundamental because it’s dispensable. The nine worlds we know & live in are the only way to the enlightenment of Buddhahood. We’ll now turn to the second half of Miao-lo’s phrase: “…revealing the distant” &/or “…revealing the true” The first half of the Lotus Sutra (the theoretical teachings) & the provisional teachings reveal that the Buddha attained enlightenment in his lifetime, in India. In the latter half of the Lotus Sutra (the essential teachings), specifically the “Lifespan” chapter, we have the distinction that the Buddha actually attained enlightenment in the far distant past, hence revealing the fruit, the ren of renge. This is revealed when we consider the concept we know of as “the mutual possession of the ten worlds.” Remember that we pointed out earlier that the provisional teachings taught that the nine worlds as separate & only a select few made it to the tenth world of enlightenment, but this concept of mutual possession includes all the ten worlds enclosed & comingled within each of the others. This underscores the idea that in spite of any of the worlds we are manifesting, Buddhism is contained in each, meaning that we all have the potential to manifest enlightenment no matter how incapable we think we are—this is the essential teaching. Ikeda tells us that as Nichiren was quoting Miao-lo where he speaks of the “doctrines taught…” & this refers to the doctrines we’ve been looking at here, having everything to do with the daimoku Nam-myho-renge-kyo as it is the title of the Lotus Sutra & that it contains the theoretical (the first fourteen chapters) & the essential teachings (the latter fourteen chapters). This is given the honorific distinction known as myo, which places it as including all wisdom known & unknown. We were also shown that anyone in the lower nine worlds can attain the enlightenment of the tenth world of Buddhahood. Renge represents the law of the simultaneity of cause & effect, so the causes we make now will affect the enlightenment we seek while here in this saha world. Shakyamuni Buddha (est. ca. 563-483 b.c. ), T’ien-t’ai (538-597 c.e. ), Miao-lo (711-782 c.e. ), Nichiren Daishonon (1222-1282), Daisaku Ikeda (1928- ). Miao-lo was an important ‘ninth patriarch’ in the T’ien-t’ai school. Daishonin, Nichiren. Op. cit. : p. 983. This is part of the whole quote of Miao-lo’s given by Nichiren from Miao-lo’s work “Annotation on ‘Great Concentration & Insight’”. The title of the Lotus Sutra is: Nam Myoho Rnge Kyo. To chant this phrase is known as daimoku & daimoku is also the name for the title of the Lotus Sutra. A Dictionary of Buddhist Terms & Concepts. Tokyo: Nichiren Shoshu Int. 1983. p. 270. Ikeda, Daisaku. Learning form the Writings of Nichiren Daishonin: King Runda. Living Buddhism Sept.-Oct. 2011. pp. 64-80. …this also includes the all first fourteen chapters. The “Expedient Means”is the first part of Gongyo. Ikeda, Daisaku. Op. cit. p. 72. Saha world: the world that must be endured. …it’s been so long reading a post from you (The Rise of Modernity, Part 1) & now together we’re back continuing to think & write about philosophy again. I feel that your philosophical interests are akin to my own, with obvious variance here & there. Yet, as our ideas have converged before, we’ve overcome our differences & now I’m struggling to recall who brought up G.W.F. Hegel first. I think it was you who about a year ago spoke of writing on his aesthetics & that inspired me to read & then write on his Phenomenology of Spirit—followed by looking & writing a little on his Aesthetics. Part of my interest also came to the fore while researching, reading & writing about Althusser’s ideology. Althusser openly rejected Hegel, since whole aspects of Hegel’s metaphysical ‘excesses’ were sloughed-off by late Marxist materialism. Let it be known that the more I found Hegel’s thought to be reviled by nineteenth & twentieth century thinkers, the more I wanted to embrace him. With this said, I’m not of the mind to simultaneously let go of Althusser & the others, as I see that this impulse is too narrow-minded & not inclusive, nor wide ranging enough to adequately engage philosophers that are of opposing views. I needed to know what Hegel was all about & I wanted to try to grasp this imposing figure, who has always represented a special kind of insurmountable thinking. The only obstruction I discovered had to be overcome in my own mind. The resolve had to do with the work it takes to climb the rocks & to prepare for the inevitable confrontation with a failure to comprehend & to then re-read & to then strive for his kind of knowing that always includes the discomfort of not knowing. This continual task of re-reading is itself a kind of knowing. The conscious acquisition of knowledge has to confront what it doesn’t know in order to learn & then know better then it did before. Our eventual goals to know can be held alongside Hegel’s rushing toward absolute knowledge, absolute idea & absolute spirit, all of this is with the knowledge that philosophy should help us to be more capable of getting set on this journey of knowing & with the admission that this philosophical path is also Hegel’s way to absolute knowledge, that will include self-knowing & as a way to know the world as without the typical constraints that divide subject & object—as a pure unified knowing, that we’ll never truly know altogether. Of course, we’ll be forced to see this drive to know & to know Hegel as fraught with many frustrations & these frustrations are often mistaken as flaws with Hegel’s un/intended obscurity. I’ve decided to think of the pain felt with these obscurities as a way of confronting & comprehending the dialectic & more specifically coming to terms with the central pivot of the dialectic, known as the sublation, the aufheben. This is noticed after the very beginning of any presuppositionless sense apprehension that is being & nothing sublated, then becoming thought & that could become a moment of conceptual thinking—this process of spirit coming to know is sometimes lovingly referred to by Hegel as a way to science (we’d be good to think of this too as thinking that’s onward to philosophical conceptualization & idea). Aufheben is a unique German word that roughly means to bring up, as well as to preserve & also to cancel out, to do away with, perhaps to bring back again. I like to think of the word as a reconciliation. 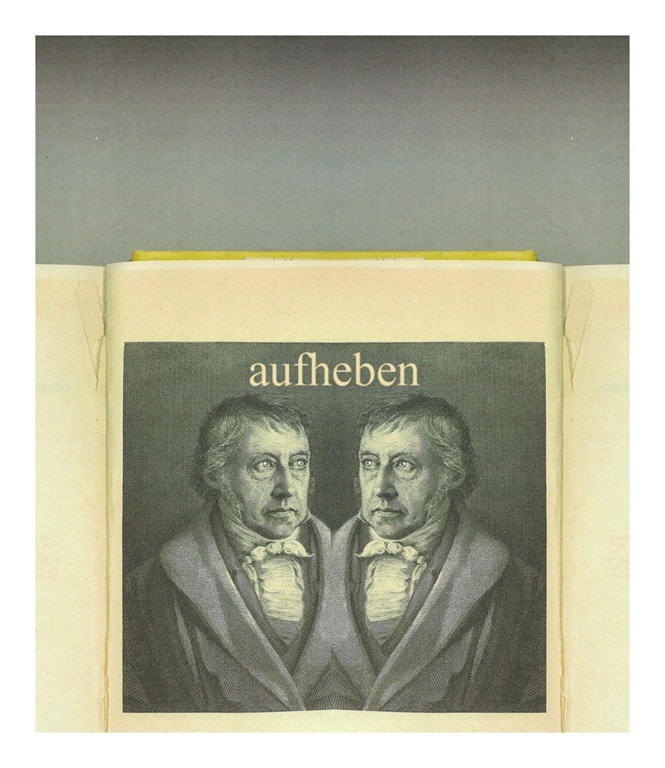 This strange self-contradicting word: aufheben—which for Fichte & our usual understanding of Hegel’s dialectic—is defined as the contradiction &/or the antithesis. It can then be thought of as related to the fundamental negation within Hegel’s dialectic. Another word we can’t ignore here is speculation, or the speculative, which is certainly linked to the above mentioned word as a reconciliation that happens within the aufheben. The speculative is a reconciling of oppositions that thereby brings things, concepts, ideas, problems, philosophy &c. into the whole of the absolute, all in the name of the Hegelian dialectic. I’m sure Hegel thought of the whole of his philosophy as speculative, which again underscores the word aufheben. In short, we have to pass through, push down, bring up, & preserve the aufheben to really know Hegel. From this initial confrontation of mine & back to the actual point of simply thanking you for your interest in Hegel, we’re drawn to a conclusion that when we sit down to study Hegel, to think about Hegel & then to sometimes reject Hegel, we’d be amiss to not take notice of the dialectical & speculative logic he laid for out us. This urges us to take notice of how he could’ve predicted his own negations, his potential demise, whereby the absolute spirit of our contemporary way of knowing has included & possibly grown out of this foreboding presence known as Hegel’s philosophy. This way of thinking about the dialectic includes his own speculative end, but never an end absolutely, as any ending has to include Hegel coming before us. We must not confuse this with the potential to lead us nowhere, since we can remember that his telos leads us to a transformation of the whole that once was, to the whole that can be & that won’t be overlooked as brought forward by Hegel. As you already know, what we’re talking about is spirit, absolute spirit. The realization of reason is universal & it is spirit as the realization of the idea. The spirit is a determination of the self as it is also a determination of science, religion, knowledge & art. The goals of history, its telos is reason & it is the idea as it’s manifested via the spirit of man as an individual & as a collective. All of this can be thought as the expression of freedom. The objects of thought are what spirit contemplates as consciousness. Freedom is not something that the spirit merely strives for, it is also contained in the basic structure of thought as it knows itself in a self-determined way & not in a pre-ordained, deterministic way. The limitations of the world are what cause our own determinations to become what we are. It is the idea that becomes a goal for the knowing subject, the idea where the concepts of subject & object become sublated, a kind of pure knowing to eventually be without the subjective/objective distinction, the two are conflated as a free idea. There are seeming contradictions that arise from the idea that man is free, while he’s also confined to the rules of the state. Hegel addresses this in the Philosophy of History: “The concept of freedom is such that justice & ethical life are inseparable from it…” & later in the same paragraph we find the conclusion: “…such restrictions [of the state, laws, government &c.] are the indispensible conditions of liberation; society & the state are the only situations in which freedom can be realized.” It has become evident that Hegel’s thought was consistent throughout the Aesthetics, the Philosophy of History, the Philosophy of Right & many other places. What I find intriguing is that while you outline the details of how you read his Aesthetics, absolute spirit emerges, in the way it manifests itself through the individual & how it includes the expression of man’s spirit, freedom & idea that are communicated into art & also into world history. We already know that Hegel designates in the Aesthetics that philosophy supersedes the arts & just about everything else. Thus creating a kind of philosophical bird’s-eye-view where Hegel can then look to the pattern of how art has expressed itself in a religious context & that this religious context for art has passed. The apogee of art as a religious expression has been superseded by ‘lesser’ ideals. In the introduction of Hegel’s Aesthetics we find this put in Hegel’s words: “We have got beyond venerating works of art as divine & worshipping them.” & in a couple of sentences later we find: “…art, considered in its highest vocation, is & remains a thing of the past. Thereby it has lost for us genuine truth & life & it has been rather transferred into our ideas…” What’s of note here is that “art’s imminent demise” (as you put it) is also due to this observation of Hegel’s that’s brought together with an implication that the individual is sublimated into the apparatus of the state & that this is a condition of art’s demise as it stand today. I believe that this can be maintained, while at the same time retaining & integrating an idea of an art that values thought, conceptualization & reflection. Little did Hegel know that this would hold true & we’ll be sure to include the all-important ‘concept/idea’ as the driving force behind much of art created recently. As vital as concept is for Hegel’s philosophy, it is also just as intrinsic for a comprehension of artistic practice today. Once religion took ultimate precedence & now it’s thought, reflection, idea & concept. Hegel wasn’t too far off, especially if we consider this within the dialectic, whereby we can see that the self-negation of art has been happening over & over, throughout most of the 20th century (continuing into the 21st). The so-called death of art as a practice & theory has been a (now stale) recurring theme for decades now, yet artistic practice continues to negate itself & to push man’s spirit onward. Art occupies a curious place in today’s world & in that bizarre presentation we’ll see it as a glaring reflection of our own thought, questioning, pain & suffering. Our own pain is addressed in ways that make art appear to be too honest, too brutal. These confrontations are certainly the aufheben for us to bring a fresh re-reading into the world as a free expression of where we’re at in our world, in our spirit, in our minds & universally. We are called upon to conceptualize ourselves thinking about an art that struggles a great deal to let it self be known, as much as we are placed with the responsibility of knowing ourselves how to comprehend just a bit more of it than we did yesterday, till tomorrow places us within a new challenge to think of art again & to not know what we’ll eventually never know absolutely. Hegel leaves us with known & unknown pieces of his wisdom to carry on with the work of thinking that will observe the beauty of striving to know something/someone once more. Hegel, G.W.F. Aesthetics, Lectures on Fine Art Vol. 1. Trans. T.M. Knox. New York: Oxford U. Press. 1975. print. Hegel, G.W.F. Lectures on the Philosophy of World History, Introduction. Trans H.B. Nisbet. Cambridge: Cambridge U. Press. 1975. print. Kant, Immanuel. Grounding for the Metaphysics of Morals 3rd ed.. Trans. James W. Ellington. Indianapolis: Hackett. 1993. print. Magee, Glen Alexander. The Hegel Dictionary. New York: Continuum Pubs. 2010. print. If we were to ask ourselves, without any prior knowledge of this rhetorical artwork, who will be the audience for Strayer’s work?—we’ll have to admit that it’ll be limited to a philosophical and artistic crowd. Within that group, it’ll then be narrowed down to those who are familiar with conceptual, theoretical and/or language based art. Presuming that this art has a limited audience will position it into a rarified area of specialization and intellectual connoisseurship. Speaking of all of who it’ll appeal to will implicate (and thereby exclude) those who choose to not appreciate its intellectual rigor and subtlety. We’ll be keen to mention that one need not engage art that doesn’t appeal to one’s own taste, to do so would just be a labor that’s without the requisite aesthetic fulfillment one might have in considering another choice of conceptual art, a painting, a sculpture etc. Because one doesn’t prefer a particular work of art only reflects personal taste and does not necessarily speak to the work’s intrinsic value, that’s qualified by experts and those who will acknowledge, judge and value its aesthetic and philosophical worth. “[←] CONCEIVING OF THAT OF WHICH ONE CANNOT FORM A CONCEPTION [→]” This is our base statement of Strayer’s that we’re calling his persuasive rhetoric. This “essential specification” (we’ll look at this term later) is using language and aesthetics as a means of conveyance concerning his concepts on the “limits of abstraction.” As we’ve indicated in a previous essay, Aristotle writes that the art of rhetoric is not akin to a scientific way of understanding and that we must not make the mistake to think that rhetoric is be examined scientifically, or that it’ll concern itself with absolute facts and figures—this is not a positivist science. All of this forwarding is unsaid within the circular language. “[←] CONCEIVING OF THAT OF WHICH ONE CANNOT FORM A CONCEPTION [→]” The actual stated appeal is for the subject (audience) to conceive of that with cannot be a conception. This is about thought that’s prior to conceiving. This is about pre-apophantic thought, thought that’s pre-predicated, prior to logic, concepts, language, judgments and the like. 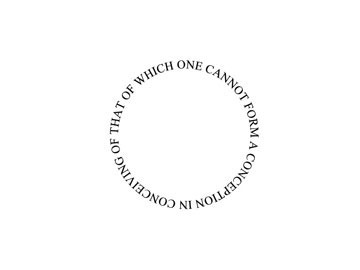 The circular rhetoric is persuading the viewer to consider a thought apprehension which is prior to conceiving of a thought, before a conception of it can be named or put forth into an idea, and before the thought can be predicated into a statement about the thought. It is presented in the first person i.e. ‘[I’m] conceiving of…” Because it’s in the first person, the subject is implicated to think of this un-conceivable thought along with Strayer as a way to aesthetically complete, and to conceive the limitations of an understanding having to do with his aesthetic entreaty. The fact that the circular appeal is repeated four times (twice in black text and twice in grey text) adds a rhythmic and filmic quality to the language. The repetitions suggest that each side is intended for each eye, right and left, and perhaps, the left and right hemispheres of the brain (rational and intuitive respectively). The liminal specifications are in focus (black text) and out of focus (grey text) only to be conceptualized at this threshold of pre-thinking. 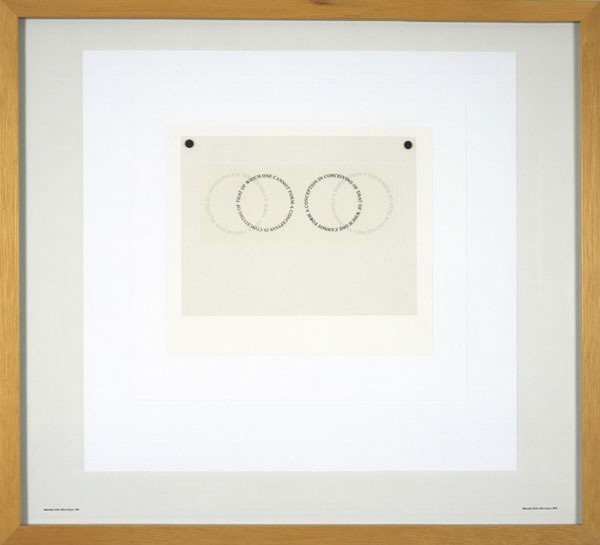 Jeffery Strayer: Haecceity 12.0.0 / 20 1/4″ x 22 7/16″. Transparent print, screws, contact print, and paper mounted to Gatorfoam. When we continue to examine the artwork, asking about its rhetorical appeals, we’ll have to get to the one that doesn’t apply out of the way. This artwork is not emotional, so it has no pathos. If we were to strain to find its pathos, it might be found in the pleasure induced by the intellectual pursuit of Strayer’s ideas and concepts. With this said, this lack might be its inherent flaw. However, this is a flaw only if we insist that all rhetoric contain all of the three appeals, and on this score we’ll have to say that all rhetoric need not fulfill all three appeals to be effective. For instance, there are plenty of examples of salient rhetoric that’s anonymous, therefore without an ethos (a discernable character by which to judge the persuasiveness of a given argument). Looking for Strayer’s ethos we’re able to find plenty of obvious examples in his work. Jeffrey Strayer is an artist and philosopher and is the author of two books: Subjects and Objects: Art, Essentialism, and Abstraction and Haecceities: Essentialism and the Limits of Abstraction. Strayer is also a lecturer in philosophy at Indiana University—Purdue University Fort Wayne. Due to these credentials his arguments are to be taken seriously enough to be regarded as a specialist in the areas of art making and philosophy. It should be said that an ethos is evident in the objects themselves, since the objects are of excellent quality, and have been executed with high production standards, this adds to the aforementioned credibility as it offers a distinct professionalism to his art. Logos is the appeal that this work exhibits in great detail. Logos can concern logic as much as it can be about rational thinking. We’re safe to say the artwork appeals to both in full measure. As for the logical, we’ll suggest that the artwork uses simple deductive logic. We can plainly deduce that the artwork is being presented in such a way as to rationally conceive of a thought that’s to be un-conceivable, thus persuading the subject to face an abstract limitation of thought. This is brought to us (the subject) under the title “Haecceity” a philosophical term meaning thisness, or better yet, the specificity of a given object that differs from any other given object, no matter how similar the two might appear. Nothing is exactly the same, everything is essentially different, is the idea behind the word. On Strayer’s website he has a couple of videos were he speaks of his intentions with the series. His predominate logical thesis has to do with an aesthetic that seeks the limits of abstraction, to this goal he names his style: essentialist abstraction. What catches our attention will have to be an idea that he names the series and each work in the series haecceities. The language he uses in each haecceity is said to be a specification, specifically naming a means to ideate a limit of abstraction. When we examine this conceptual method we find a curious logos. A haecceity is a specific object that can also be a specific idea, essentialism names things that are universal qualities of an object that are essential to make that object what it is, abstraction is also about the non-specific qualities of a particular idea or thing. When we bring all of this together in Strayer’s specification: “[←] CONCEIVING OF THAT OF WHICH ONE CANNOT FORM A CONCEPTION [→]” we are left with a non-specific object of thought that’s ultra-specific in its physical presence, coupled with universal ideations that are essential for thinking about the object, and all this is without attributable meaning, since pre-conception is thoughtless. Therefore, the lack of meaning is our logical goal, and as we’ve been taught by Hegel in his work on logic, thought before conception is nothing that’s intrinsically combined with being, together becoming thought, becoming determinate thought, and henceforth illustrating a process of our consciousness becoming capable of conceiving of a concept. Strayer does a fine job taking us from specificity to nothing at all in one artwork that’s presented in the form of rhetorically delineated language, while pushing the limits of aesthetic consideration into our over habituated minds. Aristotle. The Art of Rhetoric. Trans. J.H. Freese. Cambridge: Harvard U. P., 1967. 1357b 12-13. Print. Hegel, G.W.F. The Encyclopedia Logic. Part 1. Trans. T.F. Geraets, W.A. Suchting, H.S. Harris. Indianapolis: Hackett. 1991. pp. 135 – 145. Print. Strayer, Jeffrey. Haecceities: Essentialism and the Limits of Abstraction. Unpublished. ____________. Subjects and Objects: Art, Essentialism, and Abstraction. Leiden: Brill, 2007. Print. Aristotle wrote extensively on the art of persuasion. He easily makes the distinction that rhetoric is not the same as science. Rhetoric is not a scientific demonstration, and rhetoric typically does not try to persuade facts, since facts are understood without any persuasion needed. Aristotle definitively writes: “The function of Rhetoric, then, is to deal with things about which we deliberate, but for which we have no systematic rules […] we only deliberate about things which seem to admit of issuing in two ways […].”  He also named three appeals employed to persuade an audience to a particular point of view: pathos: emotion, ethos: character, and logos: logic. Let’s briefly look to an example of low-brow rhetoric in use today, a bumper sticker. The message is: WANT LESS. The rhetoric is logically  implied as: one should curb spending, quell your hunger for material goods, get rid of your over consumption, etc. The assumed rational message targets a consumer, as it also suggests an ascetic ideal, implying that it’s better to be less desirous than to be overindulgent. Want is a part of our lives. To ‘want less’ is to tacitly suggest that all wants are to be harnessed. Therefore, to be better people, we essentially need less wanting in our lives. A mixed message arises when we logically inquire about the quality vs. quantity of our wants. All wants are not worth reducing. For instance, should we want less out of our lives? Should we want less well being? These questions are answered with an emphatic NO! This quickly leads us the other side of the argument with worthwhile questions about our over/consumption. We can then look at how intrusive these basic wants of ours affect the lives of others we cannot see or know—e.g. how our purchasing power indirectly affects (potentially) exploited third-world laborers. Logically speaking, want is not something we can get rid of, nor should it be lessened—in and of itself. What’s at stake here is for us to try to better understand our wants and desires, more than less. Only then can we begin to educate ourselves to continually prefer a broad range of wiser choices that progress rather than regress our basic fundamental urge to want more. Our new bumper sticker should then read: WANT MORE, a logical step from having less wisdom to wanting more wisdom. Aristotle. The Art of Rhetoric (ΤΕΧΝΗ ΡΗΤΟΡΙΚΗ),trans. J.H. Freese, Cambridge: Harvard U. P., 1967, 1357b 12-13. The basic logic used for our rhetorical example is identified as an enthymeme. An enthymeme is closely related to a formal syllogism, with a part of its premises missing. The missing premise is to be assumed by the audience. Aristotle names an enthymeme as being closely related to the syllogism rhetorically rather than in a strict scientific logic—re: a ‘rhetorical syllogism’ persuades more with commonly held beliefs, rather than with scientific proofs.